Decorating a second home can present some unique challenges, says Jason Lenox of Anteks. Now that you have your sought-after weekend retreat on Cedar Creek Lake, what are you going to put in it? Bought a home away from home in Boot Ranch? What do you hang on the walls? Acquired a ski home in Aspen? What is your design inspiration? Decorating a second home is a huge challenge, especially for those who want a place that feels comfortable and easy without all the fuss of shopping for just the right arm chair, carpet, dining set, linens … Eeeeeesh. Seems overwhelming, right? If that sounds familiar, you’ll want to read on to get some sage advice from veteran vacation home interior designer Jason Lenox. Not only does he own two successful home decor stores — Anteks Home in the Dallas Design District and Anteks Curated in the Plaza at Preston Center — but he designs warm, sophisticated, rustic interiors for vacation homes near and far. 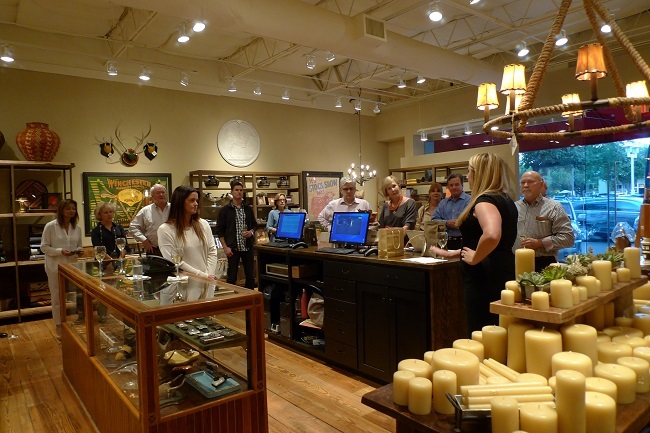 We told you that Anteks, that fabulous rustic home furnishings store in the Dallas Design District, has spun a sibling. It’s called Anteks Curated, a home accessories, furniture, and gift shop in the Plaza at Preston Center. Oh the main store is still on Dragon Street in the Design District, but this location sure beats a 15 minute drive on the tollway! While some of us despise the chilly winter winds that have been a-blowing and prefer to bundle up indoors until bikini season arrives, skiers and snowboarders alike know that the storms that blew through Colorado, Montana, and Wyoming this week (and will continue on through the northeast next week) offer the perfect, powdery platform for a fantastic weekend out on the slopes. Below, check out our top five vacation rental homes to enjoy the best of both worlds: top notch skiing paired with amenities worth traveling for. For a true ski-in/ski-out luxury chateau, don’t miss this Colorado beauty, just a few steps from the popular Four O’clock Ski Run. Plus, there’s even a rooftop patio with an outdoor spa and fireplace. Rent this five bedroom, five and a half bath mountainside home for $13,125 a week. This winter retreat, nestled in Stratton, Vermont, is minutes away from the Stratton Ski Resort. Get a couples massage at the resort’s day spa after a long day of hitting the slopes or take a short 20-minute drive to the Manchester Designer Shopping Outlets nearby. Truly get away from it all by simply staying at the home, which boasts six bedrooms, five and a half baths, a jetted tub and a jacuzzi. Rental rates are $1,600 a night, with a three night minimum stay required. I am in love with the decor of this secluded rental in Stowe, Vermont. Romp in seven bedrooms and five bathrooms in three separate dwellings set on an 8 acre hilltop, surrounded by rambling farmland. Cross-country skiers will enjoy trails located just off the property, and black diamond skiers can hit the slopes at Stowe Mountain Resort, which is just 15 minutes away. Cost to rent is $10,000 per week. At just $79 a night, this two-bedroom, one-and-a-half-bath Breckenridge condo offers amenities that rival its luxurious competitors: a full kitchen, 46′ flat screen TV in the living room, and a balcony with a mountain view. Walk on a trail to reach the ski resort or simply take the bus just 20 feet from the condo to Peak 7 and 8 of the Four O’clock Ski Run. Newly built in 2012, this 2,800-square-foot, six-bedroom rental property is located in beautiful Lake Harmony, Penn., just minutes from the lake, championship golf courses, the Poconos ski slopes, state parks, and restaurants. Soak in the six-person outdoor hot tub or play a game of pool inside this Poconos chalet for $3,200 a week. Whitney Thompson loves to daydream about the perfect beach house, but she’ll settle for a hot tub in Colorado if that’s on the menu. She is a freelance writer and contributor to SecondShelters.com and CandysDirt.com. Open Thread: Running Away For The Holidays — Where’s Your Favorite Spot to Spend Christmas Out of Town? You know what’s exhausting? Shuffling to a million different homes throughout the Thanksgiving and Christmas holidays to visit with relatives both close and distant. It gets tiring and old, and the environment rarely changes. This year, though, my family is considering running off to Colorado to take advantage of a friend’s vacation rental that fell victim to an unexpected cancellation. It’s a lovely cabin near great skiing, so of course we’re at least considering it. It made me wonder who else forgoes the holiday shuffle for a more serene and relaxing Christmas vacation. Where do you go?